Memorial scattering of ashes at sea for veterans. San Diego bay ash scattering. VA will pay a burial allowance of up to $2,000 if veterans death was service connected. VA will pay a burial allowance of up to $300 for veterans who at the time of death were entitled to receive pension or compensation or would have been entitled if they were not receiving military retirement pay. If death is not service connected, claims must be filed within 2 years of burial. Form DD 214 (record of military service), medical records, social security information, death-certificate and marriage license. Contact the Department of Veterans Affairs (VA) at 1-800-827-1000. Work with the VA’s burial and death benefits department and speak to a VA counselor to apply for all the benefits you and your veteran qualify for. Spousal benefits are available as well so make sure to ask for this too! Inform the VA that you desire your veteran to be “inured” which means that you need a space in a VA cemetery set aside for the container. And also ask for a grave marker which will display the name, rank, date of birth & date of death. Ask for a list of crematories in the vicinity of your home that will work with the VA.
Make sure to get two containers – one for the scattering and one for the cemetery. These may include an American ‘burial’ flag, a Presidential Memorial Certificate, and Funeral with ‘Full Military Honors’ if you choose for your burial at sea or at the cemetery. Contact Sail Jada at (858) 222-9479 to arrange for the scattering. The foregoing information was obtained from the VA website and other sources believed reliable. 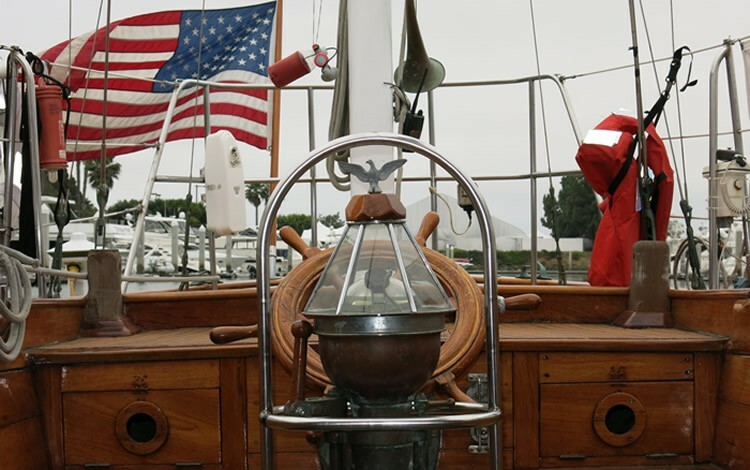 In addition to providing memorials at sea in San Diego, Sail Jada provides public yacht charters and private charter passengers with several different options. This beautiful 65-foot San Diego sailboat takes passengers seeking sunset cruises, whale watching and wedding at sea cruises in San Diego. Call (858) 222-9479 to learn more today. Click here for a memorial charter quote.